BulletVPN is very easy to use and offers decent speeds as well as the ability to unblock Netflix. It’s let down a little by a problem with DNS leaks and its three-device limit. BulletVPN is an Estonia-based company that offers VPN services through a relatively small network of servers. It’s main selling features are speed and security which are indeed priorities for many VPN users. It focuses less on things like streaming, but still offers the ability to unblock some sites, like US Netflix, to its users. So does BulletVPN stand up to its promises and can it compete with the likes of ExpressVPN? Let’s delve into everything you need to know about this VPN provider and how it compares to others! 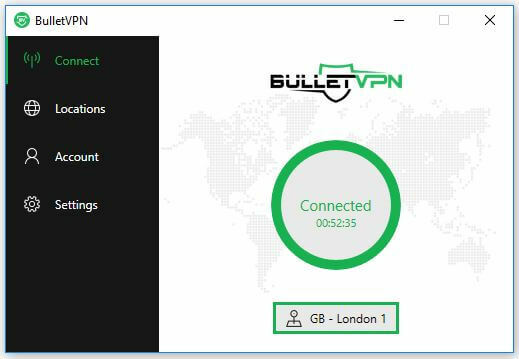 BulletVPN offers one neat package at varying prices depending on how long you sign up for. It’s currently offering a 25 percent discount on all plans. All of them, even the one month offering, come with a very decent 30-day money-back guarantee. You also have plenty of options when it comes to payment, including PayPal, credit card, Bitcoin, e-Wallets, bank transfer, prepaid cards, and more. If you sign up for a single month, with the current offer, you’ll pay $8.24 (GBP £6.07). You get a pretty big discount for going for the six-month option priced at $6.87 (GBP £5.06), although it’s certainly not as steep of a decline as we see with other providers. Finally, signing up for a one-year term with cost you $5.63 (GBP £4.15) per month. These prices are about average when compared to competitors. Although, the one-month term falls more in the low-end price range and the one-year term price is a little above average. When it comes to features, you have access to 47 servers covering 29 countries. You get unlimited bandwidth and data, and decent speeds (see our tests below) as compared to other providers. One downside is that you can only use BulletVPN on three devices simultaneously. With other providers offering five, six, or even unlimited devices, this might be a deal-breaker for some. Apps are available for Windows, MacOS, Android, and iOS. It can also be set up to work with Linux and various devices. Setup is simple but BulletVPN also offers remote support if you need it. You have the option of connecting through a few different protocols, such as OpenVPN, PPTP, and L2TP for Windows and IKEv1 and IKEv2 for iOS. Additionally, although they’re not VPN-compatible, you can connect through Apple TV, Roku, Smart TV, PS3, PS4, Xbox One, and Xbox 360 by setting up a virtual router. The other option with these devices is to geo-unblock using the Smart DNS servers that BulletVPN provides. However, this is a DNS proxy which only tunnels DNS traffic (website requests) and does not offer the privacy and security that a VPN does. Therefore, it’s definitely not worth buying the service if this is the only thing you’re going to use. When it comes to privacy and security, BulletVPN boasts strong encryption. However, a built-in kill switch and DNS leak protection are notably absent. If you’re thinking about torrenting, some servers are available for P2P. However, with the lack of kill switch, you may want to look elsewhere. Many VPNs are quick and simple to set up but this was especially easy, making it ideal for beginners. You can immediately tell when you visit the clean, professional website that they have things sorted on the ease-of-use front. If you need help, you can ask for remote support, although this likely won’t be instantaneous as there is no live chat. For the purposes of this review, we tested the Windows client and the iOS app. Once you install and run the desktop app, you’ll be asked to enter your credentials. Then the app will run from the taskbar for easy access. The main screen houses the all-important Connect button and also tells you which server you’re connected to. You have to hit the button again to disconnect, although it doesn’t indicate this. You could be left wondering for a couple of seconds if anything is going to happen. It’s a small microinteraction user experience issue, but something that could be avoided. It’s also worth noting that you have to disconnect before you switch servers. Otherwise you’ll be met with a nasty error message. The Locations screen simply shows you your server options and can be accessed by hitting the button on the left or the server location button underneath the Connect button. You can utilize the search icon or if there are certain servers that you use often, you can click the star to the right of each of them. They will then be easily accessible via the Favorites tab. Next you have your account information and below that is the Settings tab. We’re used to seeing quite a few more options when it comes to settings, but BulletVPN has just two. You can change your protocol or alter your port, depending on your encryption needs. 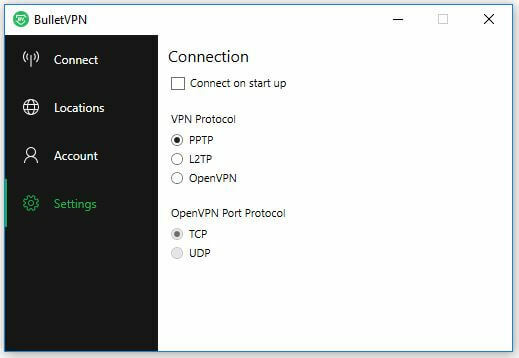 While the super simple setup and operation of this VPN might leave some looking for more, it’s undoubtedly ideal for beginner users. Once you’ve downloaded the app, you just need to allow it to run and enter your passcode, and you’re all set. This client has pretty much the same layout as the desktop version. The main screen is similar with the Connect button and server location. The other important screen is the Settings screen where you have a couple of options. You can opt to connect on startup, which is a handy feature. You can also change your protocol here – choose between IKEv1 and IKEv2 for iOS. Finally, there is the Search tab which shows you the various server locations. Aside from the Favorites feature, you can also search for a specific server location. BulletVPN has a pretty small network of servers with just 47 servers covering 29 countries. However, many of them are located in the US, so if it’s US geo-blocking you’re after, you’re in luck. 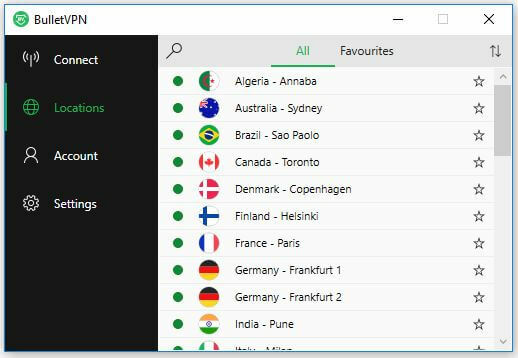 As mentioned earlier, the desktop client enables you to save certain servers as favorites for quick and easy access. Although the network of servers is small compared to many larger VPNs, the overall service was reliable. We played online games while connected to various US and UK servers and had no issues. We also streamed 1080p using the same servers without buffering. Additionally, connection to and disconnection from servers never took more than a few seconds. We did experience one connectivity issue during our speed tests. At one point, the connection was dropped and the app seemed to disappear. We then had to relaunch, enter login details, and reconnect. But at the time, there was no indication that we weren’t protected. A kill switch would be a nice addition (more on that below). When we carry out our speed tests, we try to be as empirical as possible. As such, for each test, we downloaded the same file (~100MB in size) from a server in Oregon. The tests were conducted in Toronto, Canada, using three sample VPN servers in the US West (Portland), US East (New York), and UK (London). We repeated the tests at three different times throughout the day. In the boxplots below, the thick black line represents the median download time, while the red diamond represents the mean. Lower is better. As you can see from the results, BulletVPN faired okay when it came to the tests. It wasn’t the best performance we’ve seen but it wasn’t the worst either. When using a server geographically close to the one the test file resides on, speeds were about double to three times those of the control. Then, as expected they get quite a lot slower as you get further away. The spread in results was small, so at least you’ll know roughly what to expect once you’ve been using it for a while. Of course, it’s important to point out that these tests aren’t definitive and can only serve as a general indication of the performance you might see. The inherent volatility of the internet adds a significant factor of randomness, so these tests should be taken with a grain of salt. They were run while using a 30Mbps connection, so you’ll likely see longer wait times with a slower connection, and perhaps smaller or larger discrepancies. We tested Netflix access using several servers in the US, Canada, and Europe, including UK, France, and Germany. One of the servers we tested in Portland, Oregon was successful in unblocking Netflix. So if you’re looking to unblock US Netflix, at least some of them should work. Netflix access is an ongoing issue for VPN providers and some are having more success than others. Indeed, it’s a bigger concern for some, Keenow for example, especially if it’s one of their major selling features. BulletVPN doesn’t actually advertise Netflix access but they did tell us they aim to provide access to US Netflix at least. Users may also be looking to unblock other streaming sites like Hulu, Amazon Prime, and BBC iPlayer. While Amazon Prime doesn’t work with all servers, it worked with a couple. We were also successful with BBC iPlayer with two of the UK servers. Indeed BulletVPN told us that it always maintains at least some servers working with each streaming service. Does BulletVPN work in China? A representative of BulletVPN states that the service does currently work in China. By bypassing China’s Great Firewall you should be able to gain access to sites like Facebook, Google, and YouTube. As for security, BulletVPN uses 256-bit encryption, and SHA-512 is used in conjunction with 4,096-bit RSA keys for authentication. 256-bit encryption is often referred to as “military-grade” and indeed is considered pretty much as good as it gets. As mentioned, you also have multiple protocols to choose from depending on your operating system. Within each client, you can toggle between protocols in the Settings screen. BulletVPN doesn’t claim to provide DNS leak protection, but this, along with IPv6 leak protection, is typically expected from a VPN provider. It uses its own DNS servers instead of public ones, which is a good thing. However, all of the servers we tested showed signs of DNS leaks. Apps from many other providers come with a built-in kill switch, so that the internet connections drops as soon as the VPN connection is lost for whatever reason. This handy feature acts as a backup to protect your information. Unfortunately, it is not something that’s included with this particular provider. Visiting the Support tab on the website will offer you a number of options. You can access Setup Guides which are well presented and easy to follow. You also have Troubleshoot and FAQ pages, which are helpful, although far from comprehensive. Finally, you have the option to contact support. Many users will no doubt appreciate the fact that support is offered in English, French, German, and Danish. We tried sending a support request and received a response 22 hours later, which is a bit slow considering it was marked as urgent. However, there were multiple issues in the one request, so this may have had something to do with the delay. 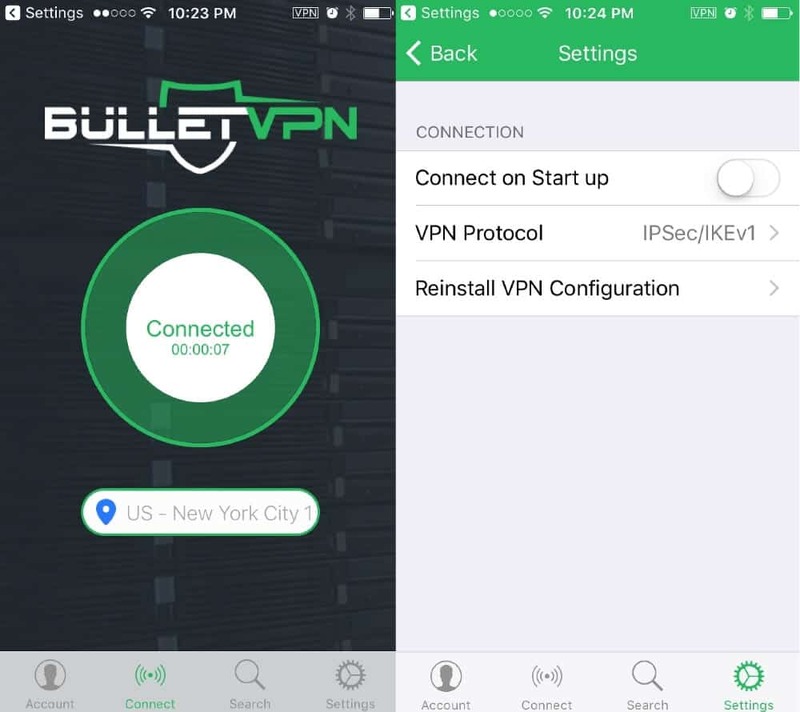 BulletVPN is extremely easy to use and provides a remote setup service, making it a solid option for beginners. It also offers a reliable connection and select servers have the ability to unblock sites like US Netflix, Amazon Prime, and Hulu, so it’s suitable for those wanting to stream. BulletVPN has okay speeds, although not as fast as others we’ve tested, such as Hide.me. This provider is let down a little by the security issues we observed such as absence of a kill switch and DNS leaks. For those looking to connect more than three devices simultaneously, you’ll have to look elsewhere.